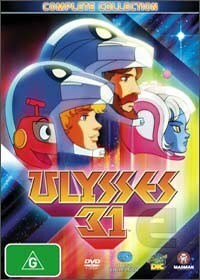 Another 1980's classic cartoon blasts its way on DVD with "Ulysses 31 the Complete Collection" that successfully joins two genres (fantasy and science fiction) into one of the best animation series of all time. When our valiant hero from Earth, Ulysses, angers the ancient Greek gods, his entire crew and space ship is hurdled into the furthest reaches of space where he encounters a variety of challenges from these gods that include historical myths such as the Cyclops, Poseidon and even Antiphates the Great. Fortunately for Ulysses, he is joined by his reckless son Telemachus, Yumi, a young female alien telepath and also my favourite robot of all time, Nono who has a nasty habit of getting itself into danger at almost every turn. By working together and with Ulysses trusty dagger lightsabre, they encounter danger, heroics and the wrath of the gods as they endeavor to reach the birthplace of their ancestors, Earth. Both the video and audio quality of this title is a little dated but even on our LG Plasma, the quality was quite acceptable that made it quite easy to get lost in this entertaining series. This collection features over 650 minutes of Ulysses 31 that contains the entire series of this popular Japanese cartoon series which contains one of the best animation storylines of the 1980's and even that catchy "Ulysses" theme song that is still inside my head after two decades. Highly Recommended to anyone who loved the series or for those that wish to experience that "retro" feel again. Great Stuff!